Add a modern feel to your living room with this three seat sofa. 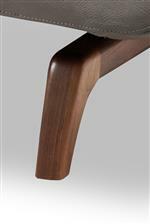 Track arms with angled front and back edges provide a unique look to the piece. The frame seems to float above the floor as it is supported by the solid walnut legs that feature a natural looking finish. 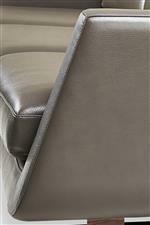 The Nash Contemporary Sofa with Angular Track Arms by American Leather at AHFA in the area. Product availability may vary. Contact us for the most current availability on this product.